These patch boxes break out the connections from any sample puck to standard 4 mm laboratory (banana or bunch pin plug) connectors, allowing the simple reconfiguration of arbitrary puck connections, or the quick and easy connection of custom measurement apparatus, and thus enabling the ultimate in measurement flexibility. Each box is equipped with a 2 m cable to a grey Lemo connector for attachment to the PPMS probe head, and breaks out all twelve numbered puck connections to the front panel. 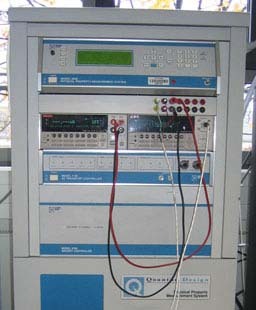 The box is designed to be mounted in a spare slot of the PPMS instrument cabinet itself, as shown in the photograph, blending in perfectly with the aesthetics of the instrument. The patch box is available in several different versions. The basic model allows for the simple direct connection of external instruments to the sample puck, while the more advanced models feature a fully configurable cross-connection to the PPMS measurement hardware (user resistance bridge or electrical transport option) in addition. Models are also available with additional built-in pass-through switches allowing easy one-touch use with the He-3 or rotator hardware while maintaining temperature control by the PPMS instrument, while the inclusion of crossover switches on the three measurement channels enables easy reciprocal van der Pauw measurements. A schematic detailing the various options is available here . These patch boxes are also ideal for use on systems equipped with the new electrical transport measurement option. The basic box can be used fully unaltered, while boxes offering cross-connections can be supplied with the appropriate connection cable for the ETO in place of that for the Model 6000. The connections on the front of the box will be reduced to reflect the two (instead of four) measurement channels available on the ETO. In response to customer requests, we have modified our popular range of PPMS patch boxes to alternatively feature BNC connectors in place of the laboratory connectors. Three options are possible: individual connectors for each signal line with the casings grounded to the box (and through that to the cable shield), individual chassis-isolated connectors, or paired signals (V+ and V−, etc.) passing through a single isolated connector. Customised connector arrangements are also available. A few examples of customised boxes we have supplied at the request of customers are shown below. If you require a custom design, simply contact us with your requirements. Box with customised connector spacing for compatibility with a specific piece of equipment. AC Transport option compatible box with front-panel connector for standard grey Lemo cable. Isolated BNC connector box with individual controlled grounding capability for all signals. The Lemo-Lemo connector cable offers a less convenient budget alternative to the basic patch box. When used in conjunction with the P150 sample wiring test station, it serves the same function as the basic patch box in a less convenient form. The resisitivity option to ACT puck connection adapter is a small, hard-wired connection box that can be inserted between the Resistivity option grey Lemo cable and the Model 6000 unit to enable measurement of a sample wired on an ACT puck using the Resisitivity measurement option. This is the adapter mentioned in Appendix B, Section 3.1 of the AC Transport Option User's Manual.